After bringing attention to the "Let's go, kneecaps" kid in my Top 5 Memorable NPCs in US/UM post, I started thinking of other unique features on pokémon that set them apart from the crowd. Because I have too much time on my hands, apparently, I decided to compile a list of the pokémon with the best moustaches! Quick disclaimer, not only is this post intended to be a joke, but it's also completely my opinion. If you think a mon on here doesn't have the most magnificent stache then...you really need to rethink your life. If you can allot time and energy into arguing with me over the best moustaches on fictional creatures, you probably have more serious issues you need to address. Seriously... But with that out of the way, let's just into the thick of it and determine who among the 800+ mons have the bougiest of lip beards! Naturally, I won't just be spitballing random compliment here and there. No! No, no...I, like any highly trained, quality moustache reviewer need to lay down a set of specific criteria on which each moustache will be judged! The following are the three categories on which all candidates' facial hair will be judged! 1.) Style - simply having facial hair is not enough to make this list! It must be stylized, and draw attention to itself! 2.) Cleanliness - not every lip beard is taken care of, and having a long, magnificent moustache is nothing if it's an eye sore because of poor maintenance. 3.) Enhancement - a good moustache must make its bearer look trés bien! The moustache must make the bearer look better than they did without it! If not, then why bother having it at all?! No, unacceptable! Now that you all know the criteria, let's jump into a few honorable mentions. Some mons whose magnificent staches just barely missed out of the Top 5 for various reasons. All these of these mons staches have great qualities to them, but each one fell short because each one lacks in one of the categories. Kadabra suffers from a lack of style. Sure, its moustace is quite clean, and the aesthetic adds to its design, but it's just hanging off its face with no emphasis and no style. Unacceptable in my salon! Stoutland has one of the longest, and grandest moustaches in the entire PokéDex, but it severely lacks in the cleanliness department. I don't care if it has no appendages to keep up its stache. If Furfrou can go to the groomer, so can Stoutland. I can only imagine the things Stoutland has gotten caught in that thing, and that loses it points in the cleanliness category. And lastly, all of the Elemental Genies has facial hair of their own, and that's just the reason Thundurus doesn't stick out as much. Thundurus-T has the most prominent facial hair of the three, but given that it's such a small part of its design, and ALL the members of its trip have it, it's just not enough to improve or enhance Thundurus-T's design. Out of my salon, you are a disgrace to moustaches! The wonderful moustache-like organ that graces the neck of our friend here is easily one of the best examples of facial hair done right in the Pokémon World. I know that Bulbapedia describes Jellicent-Male's moustache as a 'moustache-like collar', but I'm fairly certainly it's actually supposed to be some kind of buoyancy sack, which fills with air, letting it rise or sink in water. 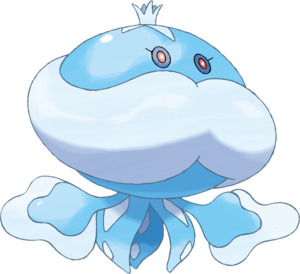 As such, Jellicent-Male loses points for its facial hair not actually being facial hair, but it meets the other two criteria so well that I couldn't leave it off the list. That stache is spick-n-span, not a drop on it. Though I imagine it constanly reeks of seawater, which loses it a point in Cleanliness. Jellicent-Male's stache also distinguishes it from its female counterpart, giving it a good score in Enhancement, but sadly (again), the fact that it's not actually facial hair forces me to put it lower on the list. Gen 5 representing with the glorious facial hair! 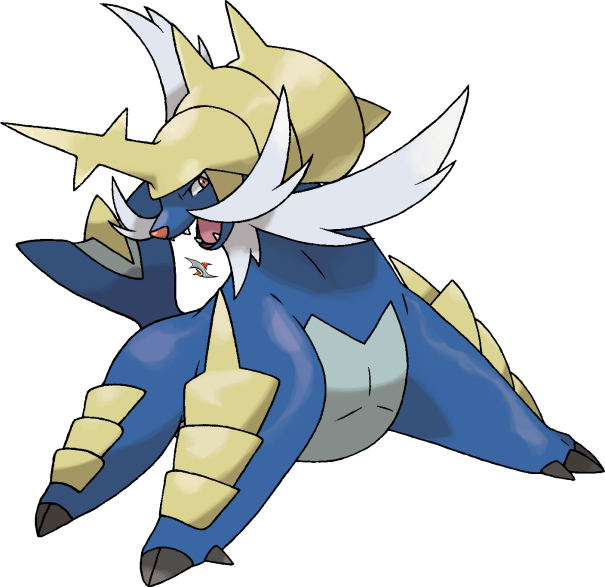 Samurott was never a pokémon that I thought of as having an excellent moustache until I started making this list! 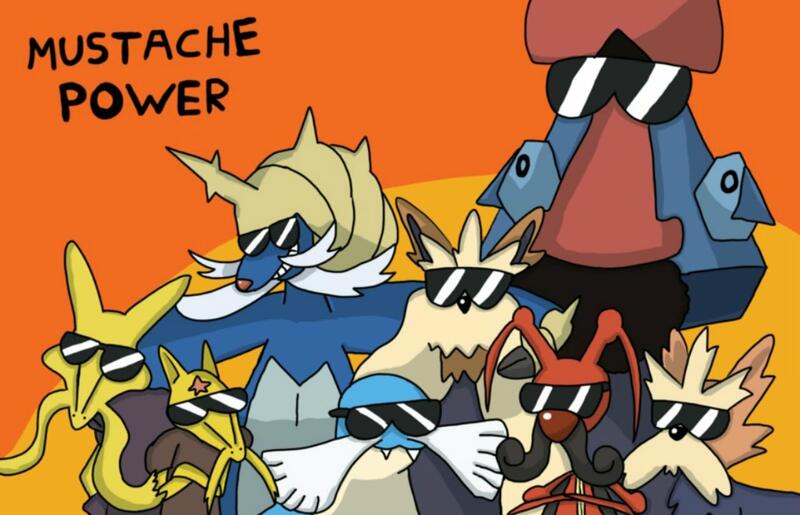 The style of Samurott's stache is undeniable. It's got that sleek blend near the end, and it ties in very nicely with the rest of its beard elsewhere on its face. It's hard for me to make a case for why Samurott's moustache wouldn't be clean, especially given that that is right around where its mouth is. Not a speck of food on it anywhere, so Samurott definitely keeps that stache clean. In terms of Enhancement, I don't think Samurott would look half as samurai-esque as he does without that stache! The enlongated features of the hair pull your attention all over his design, and without it, he'd probably just look like a seal wearing a weirdly shaped helmet. The stache ties it all together, and so Samurott takes 4th! The original moustache pokémon comes in a takes the Bronze Medal with a solid 25/30. What Alakazam lacks in Style and Cleanliness, it makes up for with the first 10/10 in Enhancement. Few staches are as defining as Alakazam's. 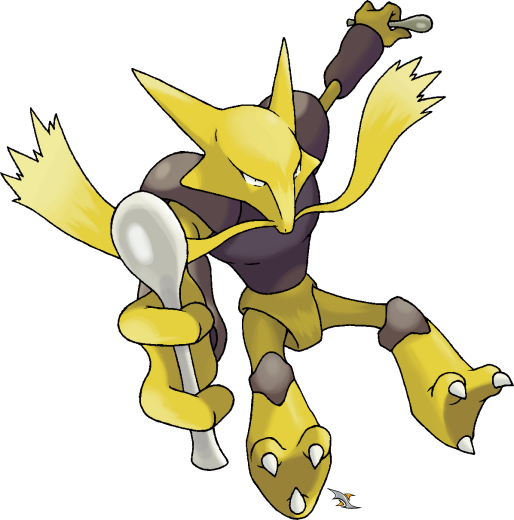 Nevermind the spoons, when you think of Alakazam, you think of the stache! Not to say the OG Moustache Mon is lacking in the other two categories. Outclassing both his previous competitors in Style, the ends of Alakazam's moustaches twist and bend outwards, signifying the use of gel. This mon takes care of his lip beard, and draws your attention to it in little ways. The place Alakazam really falls flat is in Cleanliness. It's mostly clean, but 'mostly' isn't good enough in my salon! See those split-ends!? Disgraceful! Also, the tips of your moustache do not match the rest of it. That tells me you couldn't be bothered to get your gray hairs dyed! How dare you! Shame on you, Alakazam. Until you make it rain for some conditioner and hair dye, you'll have to be content with your bronze trophy. The memelord himself is here, Kricketune! Easily one of the most recognizable moustaches in Pokémon, Kricketune sports the best moustache we've seen so far. There's no disputing the 10/10 in Enhancement here. Without its facial hair, Kricketune wouldn't be nearly as recognizable as it is, meme-cry or otherwise. It goes along with the composer-look that the artists were going for, and it really gives Kricketune a distinct stache that few mons can hope to match. Unlike Alakazam, our Silver Medalist has uniform colors across its moustache, and the tips are curled. This is not only indicative of some serious stylization, it also means that (unlike Alakazam) Kricketune takes care of its moustache with constant trips to the salon to get touch-ups. Good on you, Kricketune. You may not be particularly noteworthy outside your cry (and subsequent meme), but in the world of pokémon moustaches, you're a winner! The Gen 3 underdog (more like under-seal) comes through with the most unexpectedly magnificent stache in all of Pokémon! Honestly, do I even have to say anything? I think Sealeo's stache speaks for itself. It has volume, layers, and slits runnning all the way down the sides. There's no way that was natural, that took some serious stylizing! Not only that, but because it's right over Sealeo's mouth, it's bound to get dirty and mess up the foiling effect it has going on, right? Nope! Sealeo has mananged to maintain the shape and volume of its stache despite the many meals its consumed. And sure pure whiteness! Not a single spec of food on that thing, and ne'er have I seen such a bright shade of white. Sealeo has kept the integrity of its facial hair, while keeping it perfectly clean in the process. And you'd better believe that Sealeo's stache is enhancing! I can't imagine Sealeo without that gorgeous white stache gracing its lip. It just wouldn't look the same. I never want to see that! Congratulations, Sealeo! For having the most stylized moustache in Pokémon, keeping it clean and white despite its proximity to your mouth, and for defining the look that so many associate you by, I hereby pronounce you the Gold Medalist of this whisker war! Great job, buddy! Bringing home the gold for Hoenn! That about wraps up my Monday post. Again, this was all for fun, and I'd almost feel sorry for you if you took this seriously. Don't forget to check out Amethyst 0mega's newest giveaway. We're giving away Water-types like Sealeo, many of which are BR and legal in VGC this year! If you need one of those mons, head on over here. I'll be seeing you all again on Friday with my next post, and don't forget to let me know which mons have the best staches in YOUR opinion. What pokémon, in your opinion, has the most magnificent moustache of all? Be sure to let me know in the thread below. Keep it G-rated, and don't forget to talk to each other, not just me! Looking forward to it, everyone! Oai'i out. I know it's not very popular for being such a drastic difference from it's pre-evolutions, but Samurott has to be my favorite mustachioed mon and will be purely due to nostalgia. However, I think good old Pringles man Jellicent has a good 'stache too! 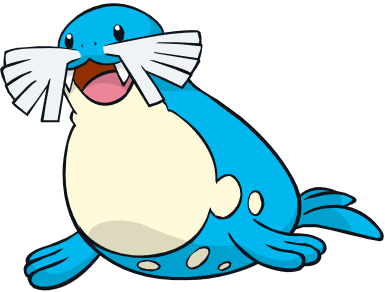 I think the best Pokémon with a moustache would have to be Swalot. Its moustache has got be the best. Just look at it! It's beauty, it's grace, it knocks you right out of the Pokémon race! @0kamii I still think that my boy Probopass deserved the gold: he is the only Pokemon that not only has a charming 30/30 probo gentleman moustache, but has a pre-evolution that has 'nose' on its very name. That is literally on the nose in so many ways! As can be seen in this Wiktionary entry, apparently the adjective 'probo' comes from the Latin word probus (meaning good, decent, honest, virtuous), a word that curiously has the same root as the English adjective 'provable' (in Spanish, for example, we say probable). If someone being 'probo' means that someone has a good moral conduct, then it looks like how our friend Probopass has the most virtuous moustache of the entire Pokemon universe! I've had no internet access for the past few days, hello again... this is also the cutest thread I've seen in a long time. Good work, 0kamii! I really like the 'stache on Jellicent. I find it mostly clean, and I think it has great style, being big and poofy and extending all the way around. I like Alakazam's, too. I think the jagged ends are flashy in an offensively-based Pokemon, though I've gotta agree, the color problems are big issues. Feels nice to be back! I think the 1st place spot belonged to Samurrot but thats only my opinion.